Review: Bob and Jim: Go – Udderbelly Daisy, Edinburgh. Bob and Jim may well be the nicest performers at this year’s Fringe. Every guest is personally greeted as they enter the venue, and then, just before they get cracking, a tray of biscuits is handed around the room. Already, at 12.20, Bob and Jim – Go is my favourite show of the day. Half way between a sketch show duo and musical comedy actors, it’s quite difficult to pin point a genre for Bob and Jim. One thing is for sure, though; together, they’ve produced a silly, but funny show. 12.20 might still be ‘children’s show’ territory, but it might be worth leaving the young’uns at the door for this show. It’s suitable for children but the jokes often dance around innuendo and can be very much adult-themed. The song that outlines exactly why The Lady is a Tramp, for example, and the running gag about Bob’s cockerel are particularly risqué moments, but two of the highlights in this show. But there’s nothing rude or malicious inside these loveable characters. 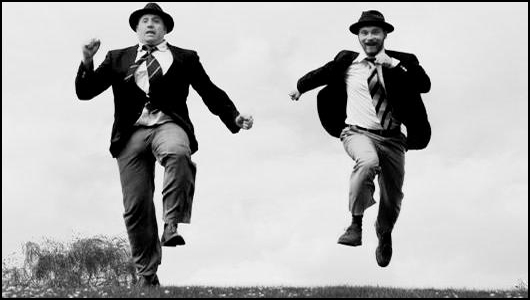 In fact, Bob and Jim are impressive all-round performers – talented musicians, convincing actors and very funny blokes. They’re more than at home on the stage, combining complete random madness with quick-thinking, well written jokes. The highlight of the show, though, is Bob and Jim’s adaptation of Karate Kid/Rocky, as they create a sketch to help deal with bullies. With dramatic kicks, a high tech Chinese man and a few comedy trouser parps, Bob and Jim unite us at the closes; both adults and the children here are in. If there’s anything to take away from this show, it’s that you don’t have to ridicule your audiences to make a joke funny; you just need to entertain them. Now, do you need a better reason to catch Bob and Jim before their run concludes? What are you waiting for? Date of live review: Saturday 18th August 2012.